One of the most highly anticipated films of 2016, Batman V Superman: Dawn of Justice will be arriving to theaters in the United States March 25th. Kotobukiya is excited to announce movie accurate versions of both Batman and Superman will be offered as ARTFX+ statues which can be placed together to form a truly dynamic scene. Combine the two ARTFX+ statues together at the base to replicate the epic battle everyone has been waiting for! The ARTFX+ Batman and Superman are sold separately so that they can also be displayed by themselves. 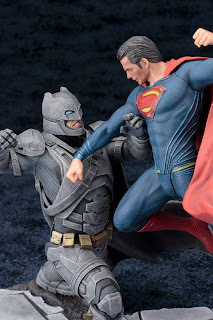 As the Man of Steel swings his punches at Batman, Gotham's vigilante guards himself with one arm, with his fist pulled back ready to strike at Superman. The 1/10 scale ARTFX+ Batman V Superman statues include all the intricate details at an easier to collect size. Don't miss the chance to own the two most famous DC Comics heroes!